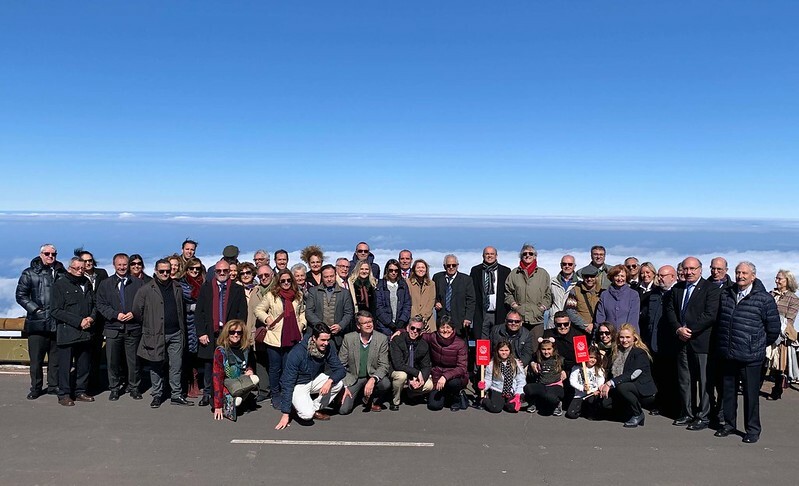 The Local Award Ceremony for the Private Water Owners of Argual and Tazacorte, Grand Prix winner of the EU Prize for Cultural Heritage / Europa Nostra Awards 2018 in the category Dedicated Service, was held at the stunning ‘Caldera de Taburiente’ National Park in La Palma, Canary Islands, on 2 February 2019. The Private Water Owners of Argual and Tazacorte (Heredamiento de las Haciendas de Argual y Tazacorte) is a group composed of 1,540 stakeholders who have managed the water and landscape of Caldera de Taburiente on a non-profit basis since 1502. The collection and distribution of the water and the conservation of the ecosystem have been the two pillars on which the activities of this group have been based since its establishment. This has generated a true culture around water and an early ecological awareness where water is valued as a precious and scarce resource. The Heritage Awards Jury, chaired by Álvaro Santa Cruz, commended the Private Water Owners for its “historical management of water for more than five centuries and for the present preservation and use of water for agriculture through a private organisation”. Sneška Quaedvlieg-Mihailović, Secretary-General of Europa Nostra, unveiled the bronze Awards plaque granted to the Private Water Owners in the presence of a large and enthusiastic audience. 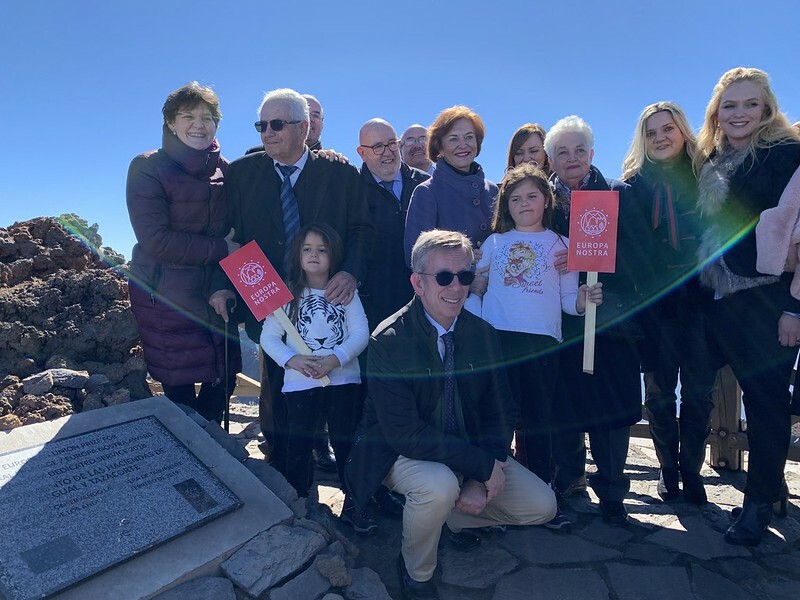 The plaque was placed in the viewpoint ‘Los Andenes’ in the Roque de Los Muchachos. Located at a height over 2,000 meters above sea level, this viewpoint is the highest point in the Caldera de Taburiente National Park and in La Palma Island overall. Representatives from national and local authorities, including the Spanish Vice-Minister for Culture and Sport, Javier García Fernández, the President of the Island Council of La Palma, Anselmo Pestana Padrón, and the Territorial Policy Counsellor of the Canary Islands Government, Nieves Lady Barreto Hernández, were in attendance and delivered a series of speeches to congratulate the winners. Among the distinguished guests were also Dr. Rafael Rebolo López, Director of the Astrophysics Institute of the Canary Islands, and Araceli Pereda Alonso, President of Hispania Nostra, who also addressed the audience. Rosendo Luis Cáceres, President of the Private Water Owners of Argual and Tazacorte, along with other representatives of the organisation, delivered a joint address where they highlighted La Palma’s position, since the XV century, as a “melting pot where people from all across Europe blended together”. They also celebrated the Caldera de Taburiente as “a pioneering example of nature conservation and excellent water management”. “I would like to thank our host Mr. Rafael Rebolo, director of the Astrophysics Institute, for welcoming us in this very symbolic place: here is where the earth and the universe meet; where heritage meets science; where the past meets the future. Europa Nostra’s Secretary General also emphasised that the Prize awarded to the Private Water Owners of Argual and Tazacorte does not only contribute to the mission of Europa Nostra, but is also exemplary for the whole of Europe: “Just as the Heredamiento formed a family of families to take care of water as a common good that requires shared care… Europe, Our Europe, is today our common good, – a vital but fragile common good – that requires a common vision and the responsibility of each one of us”. In addition to the Local Award Ceremony, the gathering in La Palma also commemorated the 30th anniversary of the ‘Sky Act’ (Law for the Protection of the Astronomical Quality of the Institute of Astrophysics of the Canary Islands’ Observatories). The ‘Sky Act’ is a pioneering law that protects the sky of the Canary Islands, to preserve its exceptional quality for astronomical observation. Due to its firm commitment to protect the quality of the night sky, La Palma is recognised by UNESCO as a Starlight Reserve. As part of the commemoration, attendees also joined a guided tour on the premises of the Astrophysics Institute of the Canary Islands, where they could visit, among other spectacular sites, the Grand Telescope of the Canary Islands (GTC), one of the largest telescopes in the world. The Director of the Institute, Dr. Rafael Rebolo López, took this opportunity to sign the Berlin Call to Action “Cultural Heritage for the Future of Europe”, adding the voice of scientists and researchers to the campaign for cultural heritage in Europe. Participants were delighted with the proposed programme, and cheerful to be part of a celebration dedicated to cultural heritage in all its forms: cultural, natural, environmental and scientific. · The Astrophysics Institute of the Canary Islands issued a Press Release on this occasion, accessible here. · Hispania Nostra published this account (in Spanish).